A lively book launch was held on November 1st at Anglia Ruskin University, Cambridge. Claire Molyneux, past MThNZ President and NZ Music Therapy Registration Board Chair, is also the Editor of Tales from the Music Therapy Room which is a collection of short stories, poetry and personal reflections from both therapists and clients from around New Zealand Aotearoa. Alongside this, the group celebrated the launch of a book co-edited by two of Claire’s colleagues, Amelia Oldfield and Mandy Carr, about music therapy and dramatherapy. The launch was well attended by many students and others. Of special meaning for Claire and many who know her, Claire sang E Tu Kahikatea and explained the significance of this waiata for those attending. 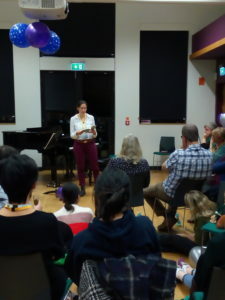 Readings were shared from both books, music enjoyed with Amelia Oldfield on her clarinet and Jo Tomlinson at the piano, and a free improvisation with all who were present combining music, sound, movement, puppets and props. It was a lovely event to launch the books in the UK and a wonderful way to connect with Music Therapy Week in New Zealand. NextTomorrows Schools review – Have your Say 2019!